September on Cape Cod - such a joyful time known to many as “Local Summer” has been one of big energy. This is the month that many of us adore and associate with warm Indian Summer days, slower streets, time to connect with friends, and an opportunity to soak in nature's beauty. However, unseasonable cool days right after Labor Day, tragedy in our waters, the Autumn Equinox, and a full moon in Aries have shifted some of these glory moments into greater impacts on our lives. How do we move through these great changes with grace and ease? In the summer months, I like many, flourish in the “side hustle” - another local Cape Cod term simply referencing the time of year in which energy is high, tourism is at its peak, and opportunities to take on projects can be bountiful. In a full time capacity I work as a sale manager for corporate groups at a local resort and part time as a yoga teacher with two regularly scheduled classes at a power yoga studio. The side hustle comes in when I take on private clients, group classes for those celebrating special weekends on the Cape, and bartending gigs. A highlight of this summer's yang energy was one night behind the bar when we were super busy. The house was packed, the music was pumping and there was a line at least three deep for ordering a drink. No matter how busy I am I always make effort to pick up my head, make eye contact with those waiting, and offer a friendly smile or gesture to assure my guests that I’ve seen them and will be right with them. It was then as I picked my head up that a man leaned in so I could hear him. I did not know this man nor do I recall having served him that evening. He said to me words that have echoed in my mind all summer and into this fall season. With a big smile on his face and a sincere tone he uttered the words “Keep doing what you are doing. Whatever you are doing it is a really good thing.” He followed up with “I know you don’t know me but I just had to tell you” and floated off with his friends. The lesson for me in this experience was one of validation in what I teach in all of my yoga classes. This lesson being that we all have a light within us and when you truly let it shine your light is received and has a positive effect on others. September is a time of transition from this high yang energy into a slower, quieter yin energy. An important time to remember the yang of these moments, such as mine with this kind man, and keep them close yet soft with ease. We do our best moving with mother nature into the next season of energy. Nature’s calendar marks this time of year with the Astrological event known as the fall Equinox (September 22nd) just last week. This is when the sun shines directly on the plane of the equator, creating equal parts of light and darkness of the day. This shift of less light in our day and more darkness can energetically be a challenge for many, I might argue if not all. Connect with nature on a beach walk, a forest run, or bike ride. Garden, harvest your crop - take joy in your bounty in which you have created as well as clear out the old to make room for spring blossoms. Cook nourishing food, maybe from your garden. Find a yoga class that speaks to you. By this I mean listen to what your your body needs, explore and decide which style you are interested in, and where does it fit in a daily schedule so that it works for YOU! Following just days after the Equinox was the Harvest Moon (September 24th/25th). Known as the Harvest Moon because of the low angle of the Moon's orbit around Earth. Around the Harvest Moon, the time difference between two successive moonrises decreases to less than 50 minutes for a few days. Early moon rises around the Harvest time means that farmers could work and harvest their crops for a longer time in the evenings. ‘FULL MOON in Aries heightens our emotions bringing our heat to the fore. Our inner fire is our sacred gift to be used wisely to activate our life force into good use that inspires, warms and illuminates. But when it’s not rightly tended to, it can become a destructive force that devastates and consumes. Our job is to learn to work with our fire, to tend to it, like we would a small child that needs attention and let it speak to us about our innermost passion and needs, so we can shift to serve them. My interpretation of this is to work through and tend to your fire within by tapping into your deepest self. I might recommend practicing yoga, sitting in meditation, being mindful or learning breathwork. These are all ways in which we can listen to our deepest self and tending to our fire within. Similar to a beach fire we might gather with friend's to cook dinner or enjoy a delicious s’more - the fire is symbolic for survival (in theory, minus the s’mores part). Like that of our internal fire it is there to light us up as human being, shining brightly in our daily lives but also to burn off the energy that no longer serves us. Together creating the best versions of ourselves that we can be, even when things “get a little crazy”. In conclusion I wish you all the healthiest and happiest of autumn season. May these offerings allow you to make some sense and aid in moving through the seasonal shift and energetic forces with ease and grace. Dana Cox is a local yoga instructor with hopes of sharing practice in order to connect with one self and community both on the mat and out in the world. 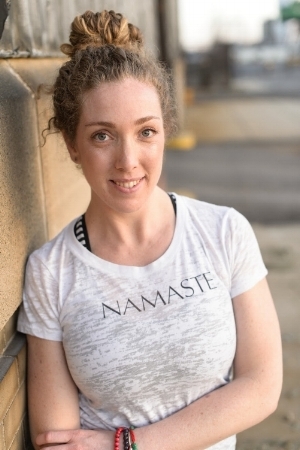 She believes that yoga is for everybody, and her approach is to make it simple, make it fun, and a way for you to connect with your body. She teaches group classes at Power Yoga of Cape Cod. Check out their Open House on Sunday, October 21st from 1pm-3pm. Click here for more info.